…New contacts and relationships in the wine world come about in different ways and take different lengths of time to come to fruition (when they do!). “Gestation” can be anything from weeks to years, decades even…every one is different. They often result from a chance comment being well followed up. Famille Labruyere and Corney & Barrow is an example of exactly that. Headed and driven by the Family’s 6th Generation – Edouard – Famille Labruyere comprises four estates. The tasting below took place for the whole team. Champagne Labruyere is the newest of the estates and will be tasted later in the year. The tasting was hosted by both Edouard and winemaker Nadine Gublin. The oldest estate in Moulin-a-Vent, the most northerly and serious of all the Crus of Beaujolais. Yields are kept very low at around 28hl/ha when they can by law be as high as 58hl/ha. In terms of winemaking the clusters are 100% de-stemmed and very little new oak is used, some barrels from Domaine Jacques Prieur are used. The tasting was from a spread of vintages but it is interesting to note that Edouard commented of 2013 that it was a “late harvest with big wines, built more for the future”. 2012 was a small crop, made with logically small yields, the harvest was around the 10th/12th of September. Red/black fruit with stoney minerals and a lovely crunch to the nose, freshness, quite bold, persistent, depth, berry fruit all the way, there is a graphite and stones scenario…very balanced, serious but starting to be approachable. Le Carquelin is a 45 year old site, shared with Jadot, on a light soil. This 2011 was harvested on 30th August with good ripeness. “One of the best vintages, balance of the power of 2009 with acidity of 2010” says Nadine. Blacker deeper fruit, more grip, delicious, balanced, nothing over the top, has a good length, a little more wood, only 10% new, very good length of mulberry fruit, long, good. Very complete. Edouard describes this wine as “Fort Knox”, it is a monopole of 0.92 hectares with vines of 70 years of age and more, graphite and sand, very defined terroir (south facing). 15 % New oak. Good rich chewy red fruit, real crunch, some rhubarb, has depth, blacker, warmer – fruit, delicious but also serious, Long and persistent. Very age-worthy. The three wines really give you a sense of the seriousness of the estate, there is a lovely balance between the savoury and the fruited. This Domaine has an unbelievable breadth of holdings: 21 hectares with 9 Grand Crus, 13 Premier Cru and 2 Lieu dits. The Cote de Beaune wines have been bio-dynamic since 2009 not that this appears on any labels. 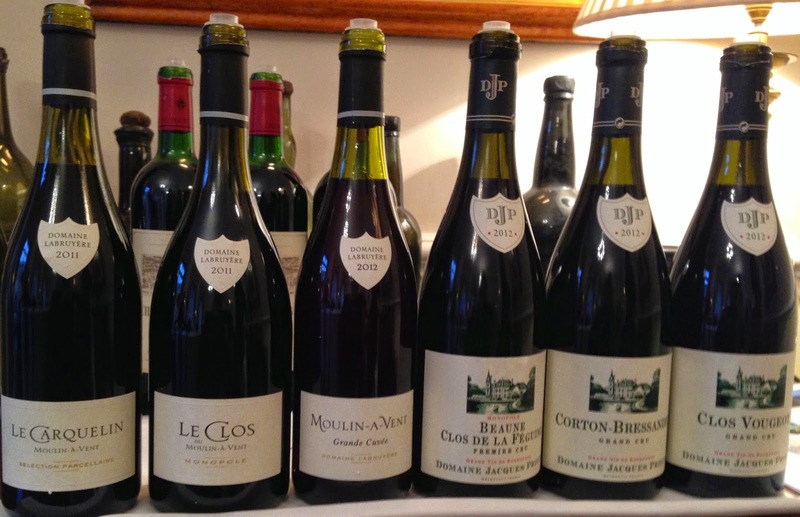 The Domaine uses four or five different coopers with very low levels of toast. The wines are always racked and kept in tank before bottling. The Grand Cru use 75-80% new oak. Clos de la Feguine is 1.75 hectares across red and white. South facing, “looking” at Pommard. 2012 was harvested in the middle of September at 20—25 hl/hectare with open wood vats, sorting tables and no pumping, just 25-30% of new oak is used. The wine was then bottled in Feb 2014. Edouard commented that this is the “Most delicate wine we have”. Rich redcurrant and spices on the nose, persistent on the nose a dash of orange rind, proper, quite bold, texture is superb, long, very persistent. Richness and boldness. Between clay and marne, a blend of terroir. Edouard commented that the ripeness is always good with this wine. The 2012 was bottled in May 2014. Slightly more of an oak framework, lovely nose of airy minerals, very balanced, some orange peel comes through, fruit is more red than you might expect, very good, like this, not dry (which I can find in Corton), long. The holding here is 1.20 hectares. It is always the last of the DJP wines to be bottled. In this instance July 2014. The site that the Domaine enjoys is very near Ch de La Tour. This is the only “lieu dits” wine in the the Domaine’s line-up. Three hectares (2.75 ha is planted to Chardonnay,0.25 ha to Pinot Noir) at the southern edge of Meursault, under 1er Cru Poruzot, this is a wine of richness. In the production process; big vats and also 1-2 years old barrels get used a lot. Exotic, rich fruits and full, has a saline note (reminiscent of a delicate Lowland Whisky) that comes from the youth. This will be yeasty in time, pears and peaches comes through, some aniseed, salty notes. Good length, Generous. Hedonistic. From the middle of the slope facing east. Many stones, it can be very hot in summer. Edouard noted that one has to be especially careful with the harvest date on this site. They pick early for the freshness. It is the last parcel at the north of Puligny near Meursault-Charmes. The wine sees 100% Barrels, 30% new and this was bottled in March 2014 having had two months in tank before bottling. Again the lowland whisky note, salt and air, a ripe brineyness, more focus and elegance than the Clos de Mazeray, really very persistent and long, very balanced, rich and really well Handled. (I have had this again since and been very very impressed). The notes here on DJP are very consistent with my observations from other tastings. Famille Labruyere bought Rouget in 1992. Edouard’s first vintage was 2008. They plant in a high density and generally the viticulture is organic with four hectares being bio-dynamic. Almost uniquely 30% of full bunches are used. The blend is a conventional 85% Merlot and 15% Cabernet Franc. There are only 2 rackings in 18 months and the blend is done before the Malolactic fermentation. From 2008 there has not been a green harvest. They are one of the last to pick in Pomerol. As a note the 2014 is 38hl/ha. We had a mini tasting. A vintage “saved” by a good September. I found this to be in a slightly awkward phase, not strange with for an adolescent Bordeaux. On the nose it was slightly stewy, a little bit developed. Some leather then some red fruit, quite old school, longer and fresher on the palate than the nose. Some iodine and a slightly ferrous blood-like core, does have freshness but not loads of it. Will be interesting to re-visit. A late vintage, hot summer, lots of rain too, large volume. This is fresher, less dense, bright and red, then the palate is lower of acidity, drink now, lovely, bright and fresh. This is not serious but it is really enjoyable. “Vintage of the century a bit like ever year” was Edouard’s amusing verdict. Blackcurrant, rich and deep, serious, a little spice, very good palate, smooth but balanced and substantial, some truffle, dark, good concentration and grip but not too much. Really liked this.